Spain is one of Europe’s most profound travel treasures. Much of the country experiences an average of 300 sunny days a year. The Mediterranean climate denotes warm, dry summers and mild winter months, so any time or season is a perfect time to visit Spain! Barcelona is Spain’s second largest city and a popular tourist destination, ranking the 4th most visited city in Europe. Barcelona contains both the highest concentration of Gothic architecture in Europe, including the Cathedral of Santa Eulalia, and more avant garde modern buildings. Stop at the National Museum of Catalan Art,r the Picasso Museum or any of the smaller galleries to explore the local art scene. The Boqueria Market provides a look and taste into the heart of Barcelona’s cuisine comprising stalls of fresh fish, fruit, and vegetables, as well as tapas bars on site. With plenty of divine culinary delights to choose from, one cannot go hungry here. In addition to delicious food, the city holds the promise of impeccable evening activities. To top off all the culture and food, visitors should make sure they don’t miss the incredible San Sebastia and Barceloneta beaches on Spain’s famed Catalonian coast. Ibiza is well known for its raucous party lifestyle, and there’s no lack of opportunity for enjoying live music and beach parties throughout the summer. Thousands travel here each year from across Europe and internationally to take advantage of the sun and sea. Aside from these activities, however, Ibiza still has plenty of lesser known attractions to offer travellers. Large areas of the island are UNESCO World Heritage Sites, and therefore cannot be commercially developed. These gorgeous, naturally vital areas are a lovely diversion from the more bustling and modern spaces of the island, which is located in the Mediterranean Sea just under 80 kilometres off the coast of Valencia, Spain. So, if you happen to be on holiday in continental Spain it can be very easy to find flights to Ibiza. Spain’s capital, Madrid, is a warm and welcoming city full of mesmerizing art galleries, incredible tapas bars, and plenty to experience. The sprawling and delightful Parco del Retiro unfolds in long paths among gardens, sculpture, monuments and galleries. This popular park is lovely year round and also is home to the Cristal Palace, a fascinating structure modelled on London’s Crystal Palace of the 1850’s. Nearby is the Prado Museum, which holds one of the premier collections in Europe. 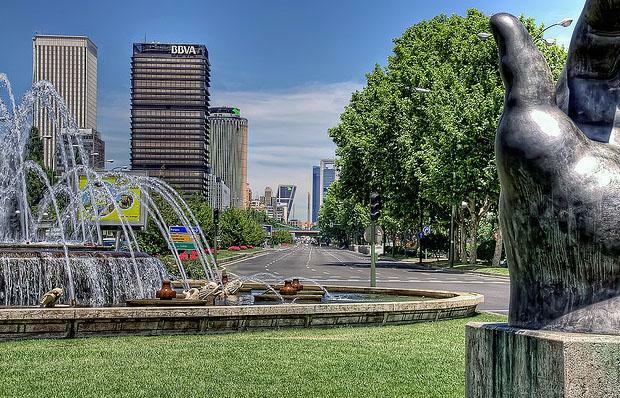 The city of Madrid has an impressive live music scene, endless opportunities to enjoy night life, and the prestige of being one of the premier style cities in the world. There is something for everyone in Madrid. On the southern coast of Spain lies Malaga, at the heart of the Costa del Sol, which lives up to its name by serving up 320 days of sunshine per year. Malaga is the southernmost largest municipality in Europe and has one of the mildest winters, enjoying a subtropical climate. La Alcazaba, a former Arab fortress originating in the 11th century, is a popular attraction to visit in Malaga. Artist Pablo Picasso was born here, and his former home is a museum now open to the public. 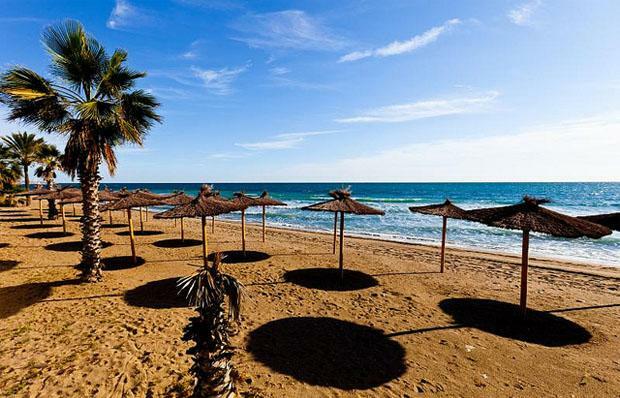 Flights to Malaga are very common all year long as this is a very popular sunny destination. Palma de Mallorca is the capital city of the island of Majorca, and it is not far from the island of Ibiza. There is plenty of summer fun on the beach and a vibrant party scene. The city also holds many festivals and cultural activities, and for the culinary inclined, there are wine tours and many restaurants offering up the Mediterranean cuisine traditional to the island. For those interested in the city’s past, a trip to the ancient Cathedral is a necessity. This imposing Gothic Roman Catholic cathedral was begun in 1229 but finished nearly 400 years later. Behind the Cathedral are the narrow, winding streets of the old city, and a flavour for Palma’s Arab heritage. It is possible to find very good deals in flights to all the mentioned above Spanish destinations if you book well in advance. Sebastian Chirino, the author of the “Spain, where the Sun is Always Shining” is travel blogger who lives and works in Ibiza, Spain.